Showbus is the largest and most popular event on the UK rally calendar. Now firmly established at the Imperial War Museum at Duxford, during the 1980s its home was in the grounds of Woburn Abbey. When the sun shone it was a Field of Dreams, but when the rain poured it was an Ocean of Storms. This article celebrates Showbus at Woburn Abbey. England's green and pleasant land - as nature intended it - at the 1984 show. 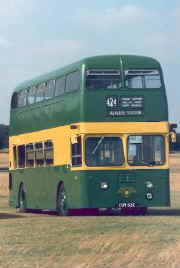 Above: London Country XF3 (CUV53C), one of eight Daimler Fleetlines with Park Royal bodies supplied during 1964, captured in a windy field at the 1983 show. See Ian's Bus Stop for complete information about this class of vehicle. Top: Two new dual-purpose MCW Metrobuses at the 1986 show - South Yorkshire Transport 1952 (C952LWJ) and Northern General 3780 (C780OCN). Bottom left: Midland Red BMMO S21 5878 (LHA878F) and BMMO S22 MHA901F, owned by the Worcester Bus Preservation Society at the 1984 show. Bottom right: Aldershot & District Dennis Lolines 506 (AAA506C) and 503 (AAA503C) at the 1983 show.